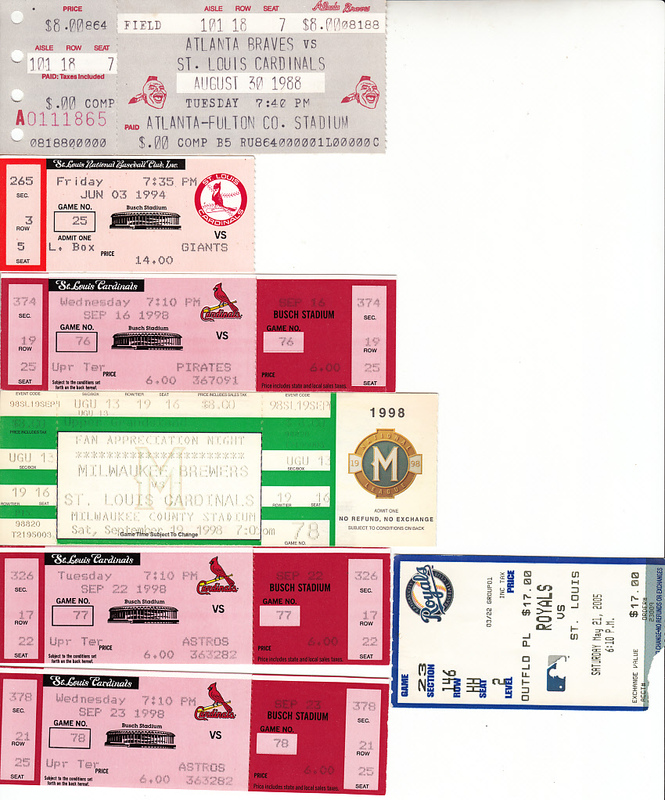 Lot of 7 different St. Louis Cardinals game tickets or stubs: 8/30/88 at Braves, 6/3/94 vs Giants, 9/16/98 vs Pirates (full untorn ticket), 9/19/98 vs Brewers (full untorn ticket), 9/22/98 vs Astros (full untorn ticket), 9/23/98 vs Astros (full untorn ticket) and 5/21/05 at Royals. The 1998 tickets are from Mark McGwire's 70 HR season although he didn't homer in those games. ONLY ONE LOT AVAILABLE FOR SALE.